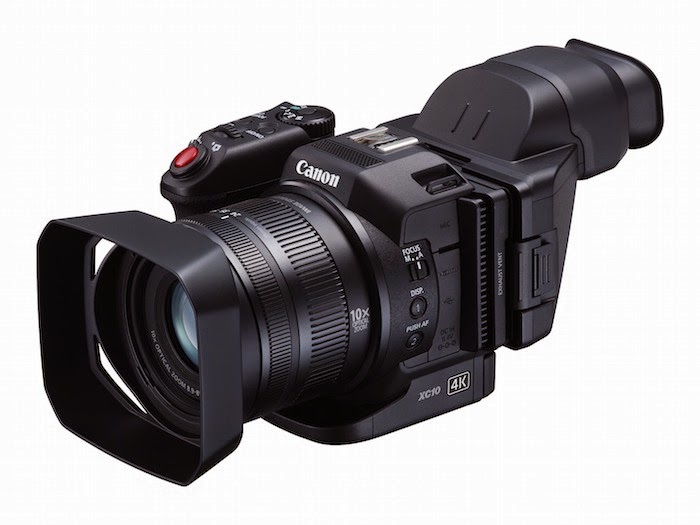 United Kingdom, Republic of Ireland, 8 April 2015 – Canon today unveils the XC10 – a compact, lightweight video and digital stills camera that brings professional 4K quality to aspiring filmmakers and enthusiasts. Inheriting many of the Cinema EOS range’s features, the XC10 offers incredible recording versatility and is the ideal solution as a small, stand-alone camera for independent film makers or the perfect accompaniment as a supporting B camera in larger productions. Boasting outstanding market leading image quality, traditionally associated with larger cameras, as well as the flexibility and ease of use of traditional compact camcorders, the XC10 delivers consistently breath-taking results. Its advanced imaging engine – a powerful combination of a specially developed 1” CMOS sensor and Canon’s new DIGIC DV5 image processor – gives both budding filmmakers or experienced pros the blistering speed and quality they demand to capture 4K video, at a wide range of variable bit rates. Able to fit seamlessly into workflows, or productions with existing Cinema EOS cameras, the XC10 can record UHDTV standard (3840 x 2160) 4K footage to an internal CFast 2.0™¹ card at up to 305Mbps, or Full HD (1920 x 1080) footage to an SD card at up to 50Mbps, with pro-standard 4:2:2 colour sampling for high resolution performance. The XC10 delivers rich colour, synonymous with Cinema EOS cameras, with a high ISO of up to 20,000, ensuring excellent results in low light conditions, and a 12-stop Wide Dynamic Range, providing vivid detail in both highlights and shadows. Uncompromising design, optimised for easy shooting. The XC10 redefines the boundaries of advanced compact camcorder design, with a body that’s instantly intuitive to use. Once in your hand, you’ll find a rotating grip that supports a variety of shooting styles, as well as essential feature controls at your fingertips, including a manual zoom and focusing ring. Designed to match any shooting preference, the camcorder features a 7.66cm vari-angle touch LCD, with 100% field coverage, providing direct access to the menu system through a simple set of cross keys, while an included optical loupe viewfinder, that fits the LCD, offers a more traditional shooting experience. Professional videographers can easily integrate the XC10 into existing production kits and workflows, thanks to its portfolio of professional standard codecs and recording modes. Canon’s new XF-AVC H.264 codec supports recording in both 4K and Full HD quality, enabling easy integration into industry- standard Non-Linear Edit systems. Canon Log Gamma also enables maximum freedom in post-production editing and processing and seamless quality matching with content shot on Cinema EOS cameras. Additionally, videographers can freely shoot in 4K, and later down convert to Full HD, to create a higher quality end product, and enable greater flexibility in the editing process. A selection of slow and fast motion recording modes – including up to 1200x fast motion in 4K/Full HD, and up to1/4x slow motion in HD – as well as interval shooting provide further creative opportunities. The XC10 will be available from June 2015 with an RSP of £1599.99.